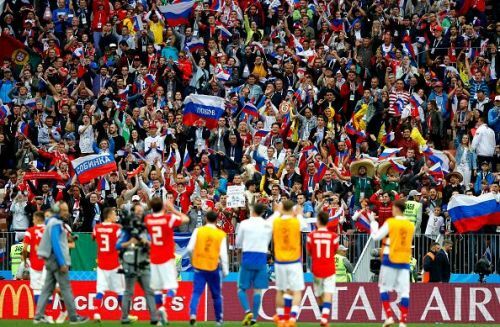 Russia came out all guns blazing at the Luzhniki Stadium and eviscerated Saudi Arabia. Russia vs Saudi Arabia isn't exactly a fixture that is likely to get the world all hot and bothered. How then, could the world not stop thinking, talking, and tweeting about it? World Cup 2018: the most glorified event in, arguably, the history of the World. And we finally had lift-off! The seats were filled, the songs were sung and the celebrities were present. Finally, we could get over all the hype surrounding the event and get down to business; get down to the football. The hosts, Russia, took on Saudi Arabia - who themselves returned to the competition after missing out on the last two editions. Russia were favourites going into the game against the visitors, and that's how it proved to be in the end, as the greater experience and professionalism got the hosts the perfect start to the campaign. An eventful game means that we have a lot to talk about. So let's jump right in! 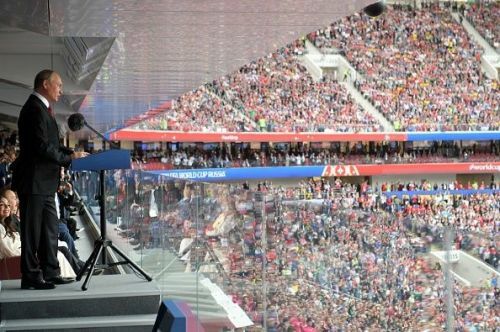 Vladimir Putin loves nothing more than the world's gaze upon him as he takes a victory lap. The opening ceremony provided the perfect opportunity for just that. The Russian president addressed the world, welcomed them to his home, and invited them to learn about the Russian way of life and it's culture. A lot of criticism is hurled at the man, on a daily basis, by media houses around the globe, but they all had to turn up to light up the stadium as their shutterbugs went off. The alternative was missing out on the World Cup, and that is not even remotely an option. Putin tried to take a curtain call when Russia hosted the Winter Olympics in 2014, but the Western influence on the global narrative meant that the world focused on the atrocities in Ukraine and the doping scandal plaguing the Russian sporting federation rather than the impressive feat, in his eyes, of hosting the Olympics. In 2018 though, the world is in Russia because the World Cup is in Russia, and this time around there is simply no ignoring the work put in by the country under its commanding leader.